Don't forget that Garden Club is next week! Join us on Tuesday, November 17th at 10 AM or 6 PM OR Wednesday, November 18th at 10 AM. We would love to have you join us! Remember, no need to call ahead. Just come with a show-n-tell in hand! Alright, there are two types of people. Those who are excited about Christmas and.........you guessed it, those who are REALLY EXCITED about Christmas. 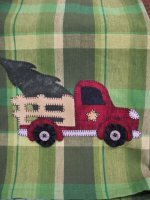 For those of you who aren't like me and play Christmas music all year long, we have some really neat projects to get you in the mood for Christmas! 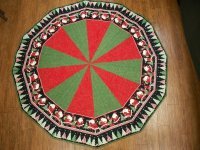 This Christmas Tree skirt can also be used as a table topper. Here is a great tip! If you put up an artificial tree, just cut a circle in the center of this skirt and slip it over the tree stand. Then put the tree in the stand. Voila! Isn't that easy?! Hope to see you at Garden Club!